Celebrate Sustainability is a week-long series of events, October 8-12th, hosted by individuals, departments, and groups across Yale to raise awareness and deepen campus engagement around sustainability. This year’s theme is Healthy Yale, Healthy Planet. Events will showcase innovations, celebrate successes, and explore the challenges we still face. This is your chance to refresh your bookshelves at home – bring in books you’ve read or would love to pass on, and browse the volumes brought in for replacements! Book swap carts will be located at Haas Arts Library, Bass Library, CSSSI, Divinity Library, Lillian Goldman Law Library, Cushing/Whitney Medical Library, Sterling Memorial Library, and 344 Winchester Ave. Please DON’T bring encyclopedias, magazines, VHS tapes or other audiovisual materials. Books remaining at the end of the week will be donated to New Haven Reads Community Book Bank. This event is coordinated by the Library Staff Association (LiSA). Discover how art and sustainability intersect! See examples of eco-friendly design at the Robert B. Haas Family Arts Library. Our temporary display case on the main-level bridge features books on fashion, architecture, and packaging. Additional related materials are available for browsing in our New Books area. Stop by and consider how art and saving the planet intersect during this year’s Celebrate Sustainability week! Come learn about medical sustainability and Yale’s current initiatives on decreasing its medical carbon footprint. Stop by on your way to lunch and spin the wheel for a prize! Join the Yale community from 11:30 a.m. to 1:00 p.m. for a Founders Day celebration on Cross Campus! Festivities will include harvest food and treats, musical entertainment by The Bluegrass Characters and The Yale Citations, a photo booth, and remarks by President Salovey. This year, Founders Day coincides with the celebration of the tenth anniversary of Yale’s West Campus. Home to Yale School of Nursing and numerous Yale Institutes focused on health, culture, energy, and the environment, West Campus has grown rapidly into a Yale community of over 1,600 residents. Staff, faculty and students from West Campus will have displays and giveaways. They encourage everyone to sign a campus “visitors book” and pop by the selfie wall to take a photo with fun science-themed props! 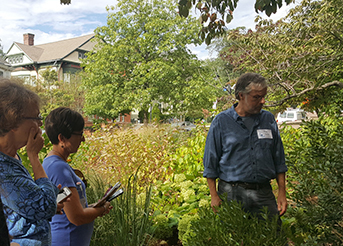 Join Peabody naturalists a and learn the importance of incorporating native plants into your landscape design. This informal walk and talk will look at the native plants surrounding Kroon Hall. We’ll discuss how native plants can reduce watering and maintenance and will benefit wildlife, including pollinators, at your home. Suitable for beginners or masters. If you’re looking to learn some simple steps to becoming clutter free, this is the workshop for you! We will focus on the different types of clutter that can affect your life, both at home and at work. This particular session will also focus on sustainability efforts at Yale and available resources for clearing clutter! Registration is required. Yale staff members who are celebrating five-year milestone anniversaries may choose to have trees planted in their honor in lieu of selecting a traditional gift. Trees will be planted on Yale’s campus by the Urban Resources Initiative. Yale groundskeepers will water and nurture the trees. Five honorary trees will be planted this year. Volunteers and honorees are always invited to attend. Come join us out at the Landscape Lab as we enjoy some last warm weather, and get the West Campus Urban Farm ready for the seasons ahead. Enjoy meeting some fellow community members and digging in this week. Production of the Yale Repertory Theater. An epic hurricane threatens Miami. A mother and daughter ready themselves for the storm as Abuela takes shelter in a world of memory, music, and magic. A powerful tale of family and forgiveness, El Huracán reveals what can be rebuilt in the aftermath of life’s most devastating tempests––and what can never be replaced. Tickets now on sale. Yale School of Music students are invited to go on a “field trip” to the CitySeed Downtown Farmers’ Market. Students will be guided by YSM staff, supplied with reusable bags, and encouraged to prioritize local fruits and vegetables in their diet. Come work with YSFP undergraduate farm managers as we steward the Yale Farm through an exciting growing season! Wednesday workdays involve soil cultivation, weed management, and infrastructure projects. Friday workdays focus on harvesting vegetables and herbs for the CitySeed Wooster Square Market on Saturdays. All are welcome to attend. Thirty-minute morning outdoor meditation to celebrate sustainability and begin the day surrounded by the natural environment. This therapeutic practice helps us to connect and awaken by opening all of the senses to the natural world all around us, even in the middle of a city. It is a simple, yet powerful way to begin the day by nourishing body, mind and spirit. Open to the Yale community only. The Sustainability & Wellness Bazaar at Yale SOM is part of the Yale-wide “Celebrate Sustainability” week celebrating the theme of “Healthy Yale, Healthy Planet”. Come learn about different groups from the Yale and New Haven communities who are working at the intersection between health/wellness and sustainability. There will be healthy food samples, a free bike repair station, and more! Join the special Celebrate Sustainability-themed Fitstyle walking tour featuring a custom route highlighting Yale’s green buildings and spaces. Led by Shana Schneider, founder of Fitstyle by Shana, participants will learn about some of Yale’s sustainability programs and innovations while taking advantage of the campus’ walkability. Come exercise and explore on this on this briskly paced fitness walk. Register for the FitSyle walk as space is limited. Everyone knows carpooling is a great way to save money on parking and gas, reduce traffic, and reduce your carbon footprint. But did you know it can also improve your health and well-being? CTrides will be on campus to educate commuters on the health, financial, and environmental benefits of carpooling. At this session you will also meet colleagues interested in carpooling from your neighborhood and find out how to get commuter rewards and benefits for carpooling. View this event on the Yale Calendar of Events. Sustainable Waste-reduction at YSPH (SWAY) will be hosting a clothing swap and waste audit for Celebrate Sustainability Week! Clear out your closet and exchange them for some new pieces to support more sustainable consumption patterns. A live waste-audit will also be held to showcase proper waste sorting practices and highlight waste generation at YSPH. Alternate rain location is Winslow Auditorium (60 College Street). Come on a hike with Yale Outdoors! We’ll meet at the women’s table on Thursday, Oct. 11, at 4:00pm. From there, we’ll go together to East Rock State Park, hike up the trails, and enjoy the beautiful views and fall colors. We’ll be back around 7:00pm. Please bring sturdy walking shoes, a water bottle, and warm layers if necessary. Sign up for the East Rock Hike. Heavy rain cancels. If you’d still like to come hiking with Yale Outdoors, we’ll have our weekly sunrise hike Friday morning. Assuming the weather clears up, we’ll be meeting at Phelps Gate at 5:45am to walk to Long Wharf. Afterwards, there’ll be an optional trip to Cody’s Diner for breakfast. As part of its Chewing the Fat speaker series, the Yale Sustainable Food Program is hosting Wanqing Zhou for a conversation on China’s food system. Join us as we discuss Wanqing’s research and advocacy work in China, particularly on issues of industrial food production, meat consumption, and facilitating systems change. This event is co-sponsored by the Yale-China Association. This presentation will explore the models for just transition being advanced by the contemporary movement for energy democracy, and will examine historical precedents for a democratic and equitable transformation of the energy system. Ashley Dawson is Professor of English at the Graduate Center/CUNY and the College of Staten Island. He is the author of two recent books on topics relating to the environmental humanities, Extreme Cities: The Peril and Promise of Urban Life in the Age of Climate Change (Verso, 2017), and Extinction: A Radical History (O/R, 2016), as well as six previous books on global social justice movements and anti-imperialism. He is a long-time member of the Social Text Collective and the founder of the CUNY Climate Action Lab. As part of Celebrate Sustainability, Yale’s Energy Management group will lead an Energy Night Survey of Franklin & Murray College. Join Julie Paquette, Director of Energy Management, and Tom Downing, Senior Energy Engineer, to discuss energy use and identify savings opportunities during night hours. Please meet at the walkway between the two colleges. Please pre-register for the Energy Night Survey. Discover the benefits of meditation in a casual group environment. During the afternoon meditation, practitioners find a comfortable seated position, either on the floor or in a chair. Guidance is provided as needed. Sessions are led by Danielle Casioppo, Health Educator and certified yoga teacher for Being Well at Yale. She is available to answer questions before and after meditation as well. Beginners welcome! No experience necessary, no equipment needed. No sign-up required! Just drop-in. If you can’t be there from start to finish, come anyway! Just slip in or out as quietly as possible. The Department of Surgery welcomes Ellen Liskov, RDN, MPH, CDE, Registered Dietitian-Nutritionist and Certified Diabetes Educator, to give a talk on how to create healthier diets while utilizing more sustainable food sources. Every attendee at the event will be entered into a raffle to win a Yale Surgery branded travel mug! The purpose of this event is to draw attention to the scope and complexity of climate migration and displacement issues as the fall UNFCCC discussions and conclusion of the Global Compact on Migration approaches, and to produce useful outcomes that may accelerate global action on climate induced migration and displacement. Experts will address a number of perspectives including the economic, social and legal impacts of climate migration and displacement. A key component of the program will be a gap analysis of climate science needed to support Climate-Induced Displacement law and policy; topics will include the role of climate information in the legal and policy frameworks, and data tools, such as the Climate Resilience Toolkit, climate reports, and perspectives on future global climate change around the limits of inhabitability. Graduate Housing residents are invited to visit the Swap Room to find warm winter clothing and accessories donated by former residents who moved out last spring. Adult’s and children’s coats, boots, scarves, and gloves are all available. The first ten people who arrive will also be give a free graduate housing winter hat! Open to residents of Graduate Housing apartments and dormitories only. There will be multiple clean-up projects at various parks throughout the city—rain or shine. Each project will be 2-3 hours with varying start times, and staggered throughout the day. Some projects will start in the morning, while others will start in the afternoon, with the last one ending no later than 3 PM. More details about specific park projects’ start times, parking information, day-of contact, what to wear, etc. to follow as the day gets closer! United Way of Greater New Haven, in partnership with New Haven Parks and Recreation, Yale University, Yale-New Haven Health Systems, and Dwight Hall, will be joining families, friends, and neighbors for a day dedicated to beautifying the city. Sign up for New Haven Day of Caring. Edgerton Park is a beautiful area in East Rock. Join other Yale graduate students in nurturing the nature and indulging in the park’s beauty by volunteering for a cleanup. We will also get to meet and play with friendly dogs in the neighborhood. Snacks and beverages will be provided. We will meet at the park entrance on Edgehill Rd. Please register in advance. Join SSC for a group bike ride to the base of East Rock! All attendees will receive a voucher for a free month of Yale bikeshare. This event is scooter and skateboard friendly. The Urban Collective will host its first Urban Art & Wellness Talk Back during CityWide Open Studios Private Studio Weekend. Come enjoy wine, cupcakes, and dialogue with New Haven artists of color. This event is free and open to the public.